The video has gotten a lot of attention on social media since its weekend debut. “This Is America” inhabits the present as a country that places emphasis on ideals like universal liberty and equality of justice under the law, but also has had its implication in gun violence and racism. Childish Gambino, the Grammy-winning alter-ego of Donald Glover, has been one of the biggest talents to emerge in music in recent times and he showcased that on Saturday Night Live tonight which he both hosted and performed on. Childish Gambino’s “This is America” video tackles racism and gun violence, complete with blood splatter. The video has gotten a lot of attention on social media since its weekend debut. A smiling, shirtless Gambino dances throughout most of the video, but that image is juxtaposed with that of him shooting a hooded black man in the head and gunning down a black choir. At the beginning, over South African-sung melodies, a black man in a chair is playing a guitar in an empty warehouse while a shirtless Glover sings with his back to the camera. At the video’s end, he appears to be chased by a white mob. Alternating between tribal dances and viral dances, Glover sporting an exaggerated minstrel-like smile depicts a barrage of symbolism and chaos along the video. There are Jim Crow imagery, dancing schoolchildren toting firearms and a black gospel choir. Glover even opens fire on the choir, a seeming reference to the Charleston church mass shooting of 2015. Directed by “Atlanta” director Hiro Murai, the video is pretty surreal and packed full of messages. 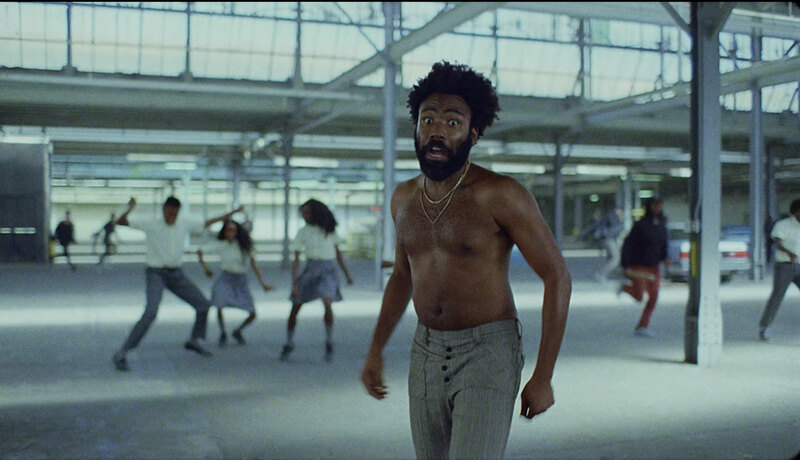 You will be drawn to Glover as a shirtless Gambino, but pay attention to what is happening in the background, where murders occur, but the guns are treated more delicately than human lives in the video—a strong statement given the current debate over gun control. The imagery in the video also has sparked conversation about several other themes including police brutality, social media and what people are really paying attention to in the United States. ‘This is America’ offers a chaotic and symbolism-heavy look at violence and racism in America. With death riding through on a horse, a man jumping to his death, police making arrests, and other visually descriptive and figurative language, Childish Gambino’s jarring new video has generated a tidal wave of discussion online. Donald Glover is having an especially spectacular week after his SNL appearance and the release of his new video for “This is America.” Glover’s FX show, Atlanta, which he executive-produces, writes and stars in, has earned Golden Globe awards. He won his first Grammy Award earlier this year for his 2016 song “Redbone.” He is starring in Solo: A Star Wars Story this spring. As Carmichael argues, Glover is using his moment to bring attention to the perils of his people, especially following Kanye West’s controversial statements on slavery and public alignment with President Trump. Other musicians and actors are pointing to the video, many calling it a work of art.